Get the computer name on which the SQL server instance is running via "ServerProperty"
In this blog, we will simply see how to get the computer name on which the SQL Server instance is running, using "SERVERPROPERTY". 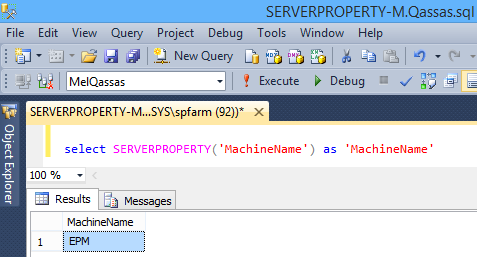 Use MachineName property to get the computer name on which the SQL Server instance is running. For a cluster, it returns the virtual server name. Get the computer name on which the SQL server instance is running using PowerShell?